Fiction: My dog is too old for surgery. Fact: Age is only one factor when evaluating an animal for anesthesia. When making a decision for surgery, one has to weigh risks and benefits of the procedure and anesthesia. Quality of anesthesia is a much more important factor to consider than age. However, age-related problems such as renal or heart problems are weighed heavily into the equation. Pre-operative screening should detect these patients. Appropriate drugs, cardiovascular support and very close monitoring with state-of-the-art equipment are necessary for a successful anesthetic event. At Ophthalmology for Animals, many of our patients are geriatric and we are prepared to administer and monitor anesthesia safely to older patients. Fiction: Animals must be especially prone to anesthetic complications because I’ve known of too many dogs and cats that have died under anesthesia. Fact: There are very few standards for quality of anesthesia in veterinary medicine because of the public’s expectations (mainly of cost). It is true that anesthetic deaths do occur in veterinary medicine but the problem is often related to late pickup of depressed vital signs. 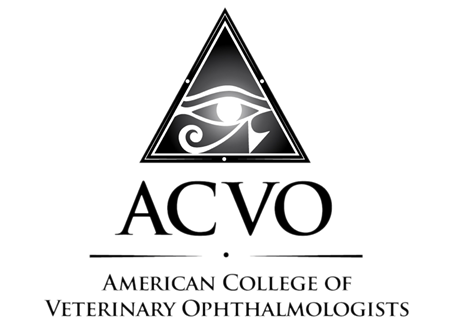 Ophthalmology for Animals uses inhalant airway gas monitoring, capnography, pulse oximetry, electrocardiography, constant blood pressure monitoring, automated ventilation support and modern anesthetics for our patients. Intravenous (IV) catheters, IV fluid support and perioperative pain therapy are mandatory in our practice and reflected in our prices. Our nurses are well trained and experienced. An unstable anesthetic patient is not a good surgical patient. We will recover a patient prior to surgery if we do not believe the anesthesia is stable. Fiction: My animal has only 6 months to live most likely and the surgery is not justified. Fact: At Ophthalmology for Animals, we feel that almost all surgeries to relieve chronic pain and suffering are justified. Six months is a long time in an animal’s life and chronic pain is debilitating, especially for old animals. Fiction: I will need to be with my animal when he/she recovers. Fact: The stress of hospitalization creates physiologic changes that can impact a pet’s surgery and recovery. We are committed to creating a calm, stress-free environment for your pet. This may entail use of sedatives and tranquilizers to ensure a smooth induction and recovery. When an animal recovers from anesthesia they are disoriented and confused. The presence of the owner can make this worse. We do not allow owners with the animals during rapid changes of consciousness (induction and recovery) for the safety of the pet, owner, and staff but we do everything we can to ensure your pet sleeps in his/her own bed the night after surgery. Fiction: My pet had problems previously and shouldn’t go under again. Fact: Anesthesia history is important but should be evaluated in light of specific drugs used and the type of problem experienced. There is a plethora of anesthetic drugs that can be tailored to each individual’s needs. Fiction: My pet did well before and will do well again. Fact: Anesthetic complications can be most devastating in healthy animals because no pre-emptive actions were envisioned. These animals mandate close scrutiny just as in high-risk patients. Fiction: My pet is going to sit in a cage all day for an afternoon surgery. I want to be first! Fact: After your pet is dropped off for surgery in the morning, records are re-evaluated and physical and ophthalmic examinations are repeated. Anxious pets will have been identified at pre-screening and we will have directed the owners to stay with them until sedatives or tranquilizers take effect. The surgery, anesthesia, and reception team then meet and discuss the special anesthetic and perioperative needs of each patient. We plan and discuss preemptive actions for potential complications we may forsee for your pet. Blood tests, auscultation of the heart and lungs, and even electrocardiography (EKG) may be repeated. Perioperative intravenous fluids may be given. The line up for surgery is not set until this discussion is completed. We will not guarantee a discharge or surgery time because this compromises our mission, a safe anesthetic period and quality procedure with a good outcome. We are efficient but careful and our day is planned to end between 5 and 6 PM. Emergencies are the number one reason surgeries are delayed and we have no control over this. All pets are walked during their hospitalization and closely cared for before and after surgery. We pay special attention to frightened or painful animals.